How Do I Create Pivot Tables in Excel Using SigmaXL? One of the most powerful features in Excel is the Pivot table. 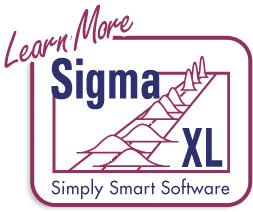 SigmaXL’s EZ-Pivot tool simplifies the creation of Pivot tables using the familiar X and Y dialog box found in the previous Pareto tools. 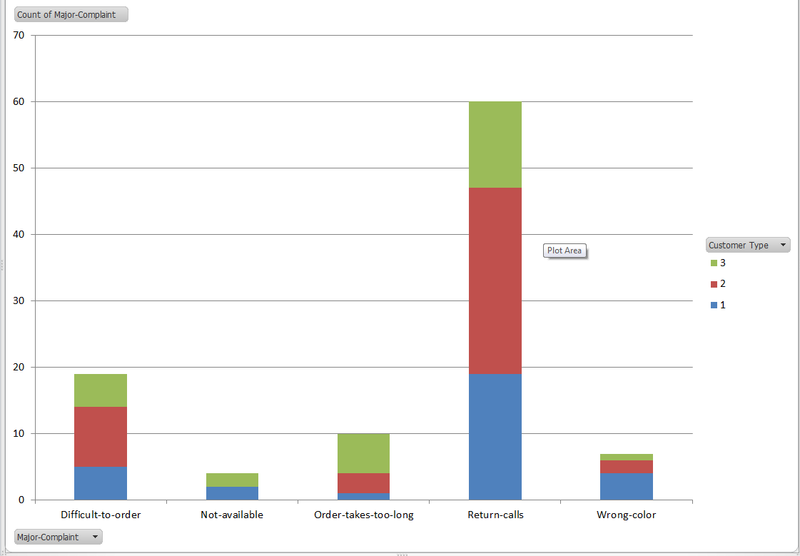 Open Customer Data.xlsx, click Sheet 1 (or press F4 to activate last worksheet). Select SigmaXL > Graphical Tools > EZ-Pivot/Pivot Charts. Select Major Complaint, click Count Category (X1) >>. Note that if Y is not specified, the Pivot Table Data is based on a count of X1, hence the name Count Category. 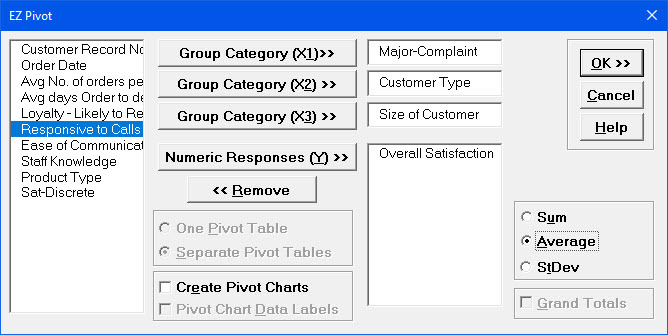 Select Customer Type, click Group Category (X2) >>; select Size of Customer, click Group Category (X3) >> as shown. 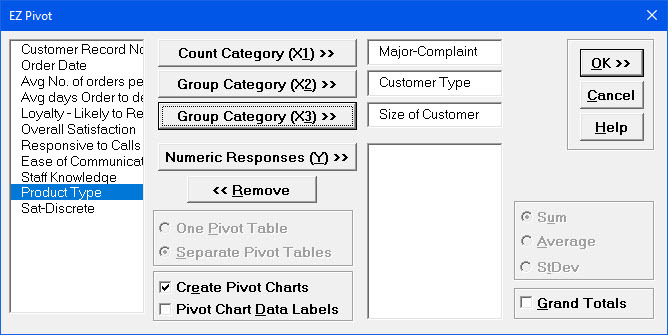 This Pivot table shows the counts for each Major Complaint (X1), broken out by Customer Type (X2), for all Sizes of Customers (X3). (Grand Totals can be added to the Pivot Table by using Pivot Table Toolbar > Table Options. Check Grand Totals for Columns, Grand Totals for Rows). To display counts for a specific Customer Size, click the arrow adjacent to Size of Customer (All). Select Large. Note that the Major Complaint "Not-Available" is not shown. Pivot table only show rows where there is at least a count of one. 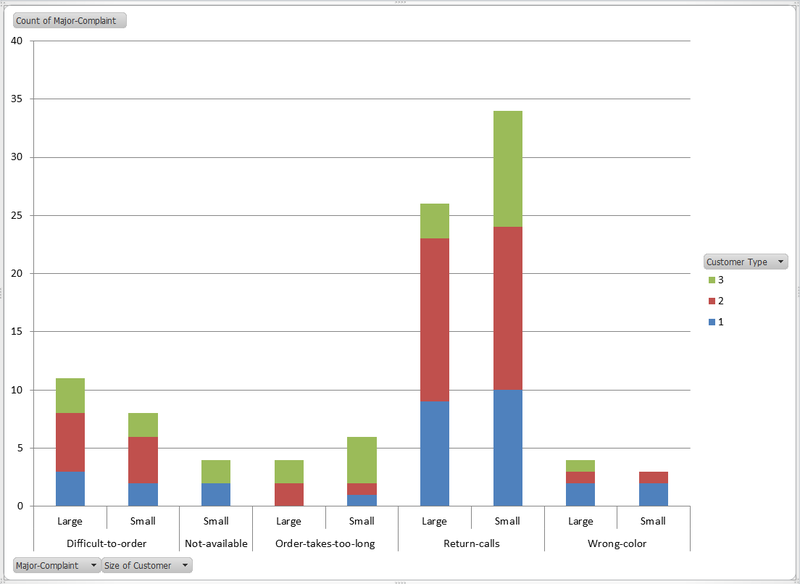 Drag the Size of Customer button adjacent to the left of the Major Complaint button and Excel will automatically split the Pivot Chart showing both Large and Small Customers (Excel 2007/2010: Drag Size of Customer from Report Filter to Axis Fields). Select Sheet 1 of Customer Data.xlsx; click SigmaXL > Graphical Tools > EZ-Pivot/Pivot Charts; click Next (alternatively, click Recall SigmaXL Dialog menu or press F3 to recall last dialog). Select Customer Type, click Group Category (X1) >>; select Size of Customer, click Group Category (X2) >>; select Product Type, click Group Category (X3); select Overall Satisfaction, click Numeric Responses (Y) >>. Note that the Label for X1 changed from Count Category to Group Category. The Pivot Table data will now be based on Y data. The Response default uses a Sum of Y. This however can be changed to Average or Standard Deviation. Select Average. 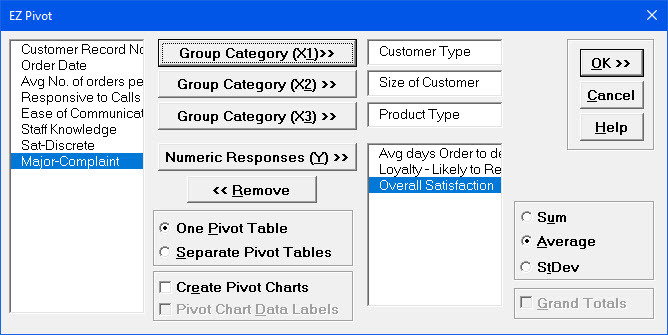 Uncheck Create Pivot Charts (Since we are looking at averages, the stacked bar Pivot Charts would not be very useful, unless they are changed to clustered column format using Chart > Chart Type). Note that the table now contains Averages of the Customer Satisfaction scores (Y). Again Product Type (X3) can be varied to show Consumer, Manufacturer, or All. 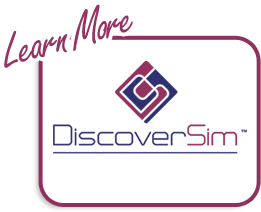 Double clicking on Average of Overall Satisfaction allows you to switch to Standard Deviation (StdDev). Select Customer Type, click Group Category (X1) >>; select Size of Customer, click Group Category (X2) >>; select Product Type, click Group Category (X3) >>. Select Avg Days Order to Delivery, Loyalty – Likely to Respond, Overall Satisfaction, click Numeric Responses (Y) >>. Select Average and One Pivot Table (default is separate Pivot Tables for each Y). Uncheck Create Pivot Charts. Again, Product Type (X3) can be varied.